This program original aired on January 21, 2019. To listen online, click here. 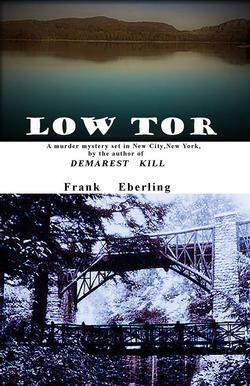 We focus on the new novel by Frank Eberling, Low Tor. This follow-up to Eberling’s earlier novel Demarest Kill is another exciting murder mystery set among the richly historical places of Rockland County. About the author: Frank Eberling is a fifth-generation New City resident wo moved to Florida upon graduation from Clarkstown High School in 1964 and became a documentary filmmaker for more than forty years. To learn more about Eberling’s Demarest Kill, click here: https://www.amazon.com/Demarest-Kill-Frank-Eberling/dp/1535127732/ref=sr_1_1?ie=UTF8&qid=1534780852&sr=8-1&keywords=frank+eberling. Crossroads of Rockland History, a program of the Historical Society of Rockland County, airs on the third Monday of each month at 9:30 am,right after the Steve and Jeff morning show, on WRCR radio at www.WRCR.com. Join host Clare Sheridan as we explore, celebrate, and learn about our local history, with different topics and guest speakers every month. For an sound file archive of past programs, visit https://www.rocklandhistory.org/page.cfm?category=22.